The late Heath Ledger. Gone at 28 and leaving shocked fans asking why? 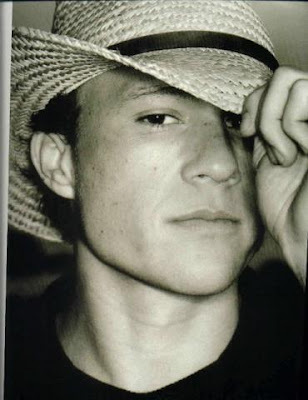 The late Heath Ledger. Who would have thought we'd be muttering those awful words about this powerhouse Aussie actor at 28? With the dust from Brad Renfro's death barely settled (the 25-year-old actor died on Jan. 15), the tragic news of Ledger's death shot around the world late Tuesday aftenoon. With it came a deluge of entertaiment "authorities" hitting the airwaves, the lot of them spouting their possible theories about Ledger's death. Heath was addicted to sleeping pills said some. He was depressed about his breakup with Michelle Williams said others. One longtime showbiz reporter even spewed out the theory that Hollywood and it's many pressures doesn't kill people. It's those deep, longtime issues Ledger bore about his parent's divorce that probably influenced this "situation." NEW YORK (AP) — Authorities said the autopsy on Heath Ledger was inconclusive and that it would take about 10 days to determine a definitive cause of death for the "Brokeback Mountain" actor, whose fans remembered him Wednesday by leaving flowers and candles outside his Manhattan apartment. The Australian-born actor was found dead Tuesday by his housekeeper and a massage therapist — lying naked and face-down on the floor at the foot of his bed, police said. Prescription sleeping pills and anti-anxiety pills were found in bottles in Ledger's bedroom and bathroom. Police said the death was caused by a possible drug overdose and appeared to be accidental. Ellen Borakove, a spokeswoman for the medical examiner's office, said the autopsy on the 28-year-old actor was inconclusive and that more would be known after more thorough tests can be completed. News of the death stunned family, fans and colleagues. NEW YORK (CNN) -- Relatives of Heath Ledger are expected to arrive from Australia on Friday in preparation for his funeral, a funeral home spokesman said. Ledger's body was taken to the Frank E. Campbell Funeral Home in Manhattan Wednesday, the mortuary confirmed to CNN. A private viewing will take place Friday, The Associated Press reported. The funeral arrangements have not been made public. The 28-year-old actor, star of "Brokeback Mountain" and the upcoming "Dark Knight," died Tuesday afternoon. An autopsy Wednesday morning was inconclusive, and a cause-of-death determination will take 10 to 14 days, a medical examiner's spokeswoman said. "There were no illegal drugs found" in the apartment, New York Police Commissioner Ray Kelly said Wednesday.